In a medical environment, it has always been challenging to achieve safe, reliable, and precise measurement of low flow rates: The LD20 series of single-use liquid flow sensors directly measure the liquid flow rate and at the point of interest for highly efficient patient treatment and enhanced safety. Currently, trends and keywords like complex drug administering, point-of-care, wearable designs, and patient compliance call for the development of smart medical devices. The LD20 series integrates Sensirion’s established liquid flow sensing technology with a cost-optimized, single-use design for high volume applications in the life science, medical, or food industry. The sensor offers a bidirectional measurement of flow rates from 1000 mL/hour down to single-digit mL/hour; at the same time, it can also reliably detect common failure modes such as free flow, occlusion, or air bubbles with unmatched sensitivity and speed. The LD20 series reduces the flow sensor to its bare minimum but still ensures easy electrical, fluidic, and mechanical connections, thus optimizing the costs. Barbed or luer lock fittings ensure simple and secure integration into the fluidic line: for instance, into an infusion set or a catheter. Inert wetted materials offer exceptional chemical resistance and splendid media compatibility. A sensor of the LD20 series can be used to precisely measure drug delivery in real time. As a result, drug therapies turn out to be considerably effective since they become simpler to monitor and control. By using the LD20 liquid flow sensor series, medical device manufacturers can improve the performance, safety, and reliability of their products such that they are beneficial to patients as well as caregivers. Medical procedures and therapies usually face by the same challenge: precise measurement and control of lowest flow rates down to the microliter per hour range. In a majority of the cases, the outcome of the therapy, and even the well-being or survival of the patient, is largely dependent on the continuous and reliable drug administration in such low flow regimes. Although a number of countermeasures have been assessed and introduced, there is more scope for improvement and for establishing new technologies. One innovative development with immense potential is a single-use liquid flow sensor with the potential to measure lowest flow rates and detect common failure modes in a quick and reliable manner. 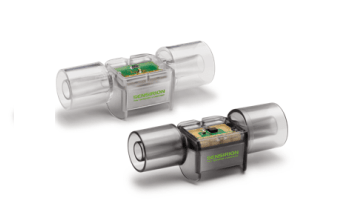 Sensirion’s unique CMOSens® Technology renders the LD20 liquid flow sensor to be adequately sensitive to detect the smallest variations in the flow rate. For example, upon being integrated into an infusion set, the sensor becomes so sensitive that it can detect the usual peaks in the infusion flow rate generated by the oscillating back pressure of the venous pulse of the patient — it can feel the heartbeat of the patient. Detection of the heartbeat on the flow rate directly suggests an intact connection of the infusion cannula with the patient’s vein; by contrast, the absence of pulsation denotes an interrupted connection. Disconnected, kinked, or ruptured tubing or a dislodged infusion cannula, which may in turn cause infiltration, could be the likely causes. 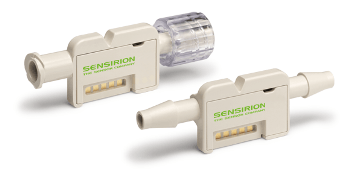 Through the assessment of the sensor signal, the sensor solution from Sensirion provides a unique possibility of quickly detecting infiltration and avoiding the harmful consequences to the patient.